Hello guys. Today's post was inspired by Xin. 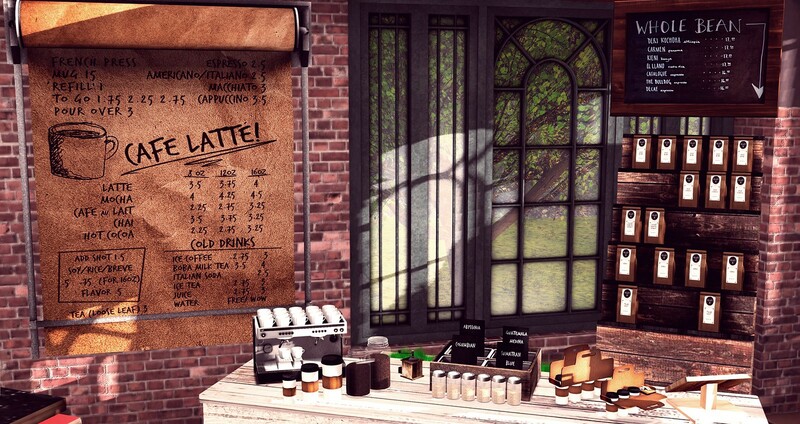 's Cafe Latte gacha available at The Seasons Story until January, 31st. Last but not least, the building you see is by Trompe Loeil and you can find at Collabor88 until February, 7th. I hope you like it and for more details please scroll down to look at the credits. Olá pessoal. O post de hoje foi inspirado pela gacha da loja Xin, que está disponível na The Seasons Story até 31 de Janeiro. O sofá é da Consignment e Floorplan, e está disponível no Uber até 25 de Fevereiro. Último mas não menos importante, a 'casa' é da Trompe Loeil e pode ser encontrada no Collabor88 até 7 de Fevereiro. Espero que gostem e para mais detalhes chequem os créditos abaixo. Counter - xin. counter + white @The Seasons Story until January, 31st. Stool - xin. 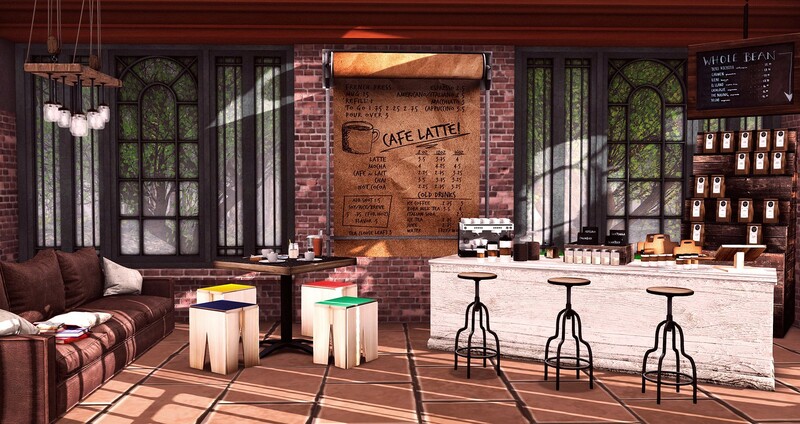 cafe stool @The Seasons Story until January, 31st. Casa - Trompe Loeil - Iona Conservatory @Collabor88 até 7 de Fevereiro. Balcão - xin. counter + white @The Seasons Story até 31 de Janeiro. Banquinhos - xin. cafe stool @The Seasons Story até 31 de Janeiro. Menu - xin. pull down menu + rare ~ Gacha @The Seasons Story until January, 31st. Xin's items are a gacha and are available @The Seasons Story until January, 31st. Encarte/Menu - xin. pull down menu + rare ~ Gacha @The Seasons Story until January, 31st. Os itens da Xin estão no @The Seasons Story até 31 de Janeiro. Sofa - Consignment.&floorplan. lazy sofa / coffee A @Uber until February 24th. Sofá - Consignment.&floorplan. lazy sofa / coffee A @Uber until February 24th.